Throughout April 2015, the National Museum of Health and Medicine, a Department of Defense museum founded in 1862 as the Army Medical Museum, will commemorate the 150th anniversary of President Abraham Lincoln's assassination in April 1865. 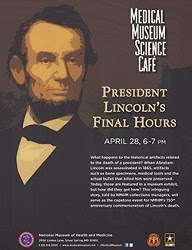 NMHM is currently featuring a special exhibit of artifacts related to the medical care Lincoln received in his final hours, as well as artifacts related to his autopsy, including the actual bullet that killed the president. NMHM is open daily from 10 am -5:30 pm and admission to the museum and to all events is free and reservations are not required. Open House, April 14, 2015, 5 - 10:30 pm Special evening hours allow visitors to see the Lincoln exhibits and participate in special programs on the actual night 150 years after Lincoln was shot at Ford's Theatre. Family Program, April 14, 2015, 5 - 7 pm Museum educators will offer arts and crafts activities for young visitors. Staff and docents will be available to answer questions and share information about the special Lincoln exhibits. Evening Gallery Talk, April 14, 2015, 7 - 8 pm Retired U.S. Army surgeon Lawrence Mohr, M.D., who served as White House Physician to Presidents Reagan, Bush and Clinton, will discuss the history of presidential health and the unique role military medicine has played in the care of commander-in-chief. Mohr will be joined by Dr. Thomas Gennarelli, a neurosurgeon from the University of Pennsylvania School of Medicine, who will discuss the management of head wounds and compare the nature of the 19th century and 21st century response to trauma. Medical Examiner, city of Washington, D.C., who will comment on the events 150 years earlier. The Search is Satisfied the Autopsy of President Abraham Lincoln, 150 Years Later -- April 15, 2015, 12:00 pm On April 15, 2015, as part of their Lincoln assassination commemoration events, NMHM will review Lincoln's autopsy, as performed by Army Medical Museum surgeons 150 years earlier that same day. U.S. Navy LCDR Lisa Rivera, deputy medical examiner, Armed Forces Medical Examiner System, will join NMHM and speak about Lincoln's autopsy. was assassinated in 1865, artifacts such as bone specimens, medical tools and the actual bullet that killed him were preserved. Today, those are featured in a museum exhibit, but how did they get here? This intriguing story, told by NMHM collections managers, will serve as the capstone event for NMHM's 150th anniversary commemoration of Lincoln's death.